When I started this website less than a year ago, I probably faced many of the obstacles that you do. I had a general idea of what I wanted to do, but I didn’t have clarity on how I was going to get there. With each transformation, my purpose became clearer and clearer. Not surprisingly, the more focused I became, the more traffic swarmed my pages. When I look back at how far this site has come, I’m amazed. I’m even a tad embarrassed by what I was doing in the beginning (it’s all part of the process, right?). But over the course of almost a year, I’ve figured it out. I’ve found extraordinary success in a very short period of time. Now I can share the secrets to how I did it so that you don’t have to go through the same growing pains that I did. As this website has passed through each distinct stage, a corresponding WordPress theme accompanied it. When I started out, I used a very basic, free theme. I was convinced that a premium theme wasn’t necessary. As my focus moved into showcasing myself as a social media thought leader, I received feedback that a premium theme was necessary to be taken seriously. I gave in and bought one. Soon, this site transformed into a Facebook and Content Marketing juggernaut of information. But my old theme could no longer sustain it. It was slow and buggy and I even experienced some security issues. With the final transformation, I moved to the Genesis Framework. It is the theme for bloggers who are serious about turning their writing into a business. The results have been phenomenal. I break new personal records for traffic seemingly every month (I’ve had over 100,000 page views for three months in a row). My site is clean, fast and well coded — all things that Google loves. I owe much of this success to Genesis! 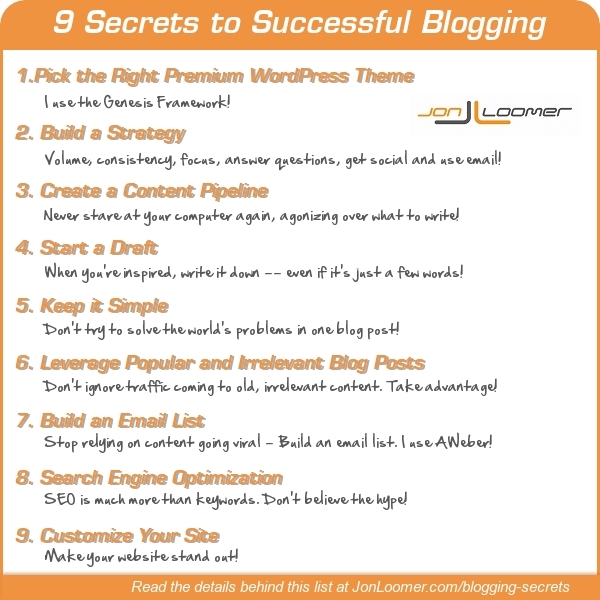 To become a successful blogger, you need a strategy. You need to turn out a ton of quality content. You need to be focused and consistent. You need to answer the questions that potential readers are asking. And you need to spread your message through social and email channels. It takes work and it takes time. But without a well thought out strategy, you’ll never get off the ground. Possibly the most important task is to consistently turn out a ton of good content. That isn’t difficult at first. But without planning, this will become increasingly tedious. I have a strategy that works. I write a blog post every day, and I never feel as though my ideas are running dry. The reason is because I have a tried and true process for coming up with blog post topics days and weeks in advance. With a pipeline, I never sit down not knowing what I’m going to write. I simply pull up my running list of blog topics. Let’s say you have a great running list of blog topics. Awesome. But then you look at your list and think… What was my angle on this topic again? That’s why I don’t stop at creating a list. I start an actual draft. Right now, I have about 20 open drafts that I can work off of for any given day. In some cases, it’s just a title and a few words. In others, it’s a few paragraphs. By creating a draft when I’m inspired, I have a head start when I need to publish a blog post. It’s a terrific time saver. When I started blogging, I tried to solve all of the world’s problems in one blog post. Then I quickly realized that I could create 10 blog posts to cover the 10 different problems I wrote about in one. I was making my life difficult. People are searching for answers to very specific questions. You only need to write one exhaustive blog post about each one. Your readers will love it. Google will love it. And you’ll be a better writer as a result. I still have blog posts that I wrote six months ago that show up in my daily top 10 of traffic. Sounds great, but there’s a rub: In most cases, those posts are completely irrelevant now. For a while, I just shrugged and ignored it. But I soon realized that I was missing a significant opportunity. I was receiving “black hole traffic.” People came to an irrelevant blog post and would quickly leave. I needed to grab them while they were here and turn them into subscribers. I’ve benefited immensely from this strategy. It took me five months before I finally started an email newsletter. The day I moved to AWeber was the turning point of this site. When I didn’t build an email list, I relied entirely on a blog post or multiple blog posts going viral. Without that, my traffic was nearly nonexistent. With an email list, though, I could regularly drive people back to my content. It’s because of this that I no longer experience significant dips in traffic. I can always rely on my email list. My list is now 2,500 strong, and I get more traffic from my email list than I do Facebook, Twitter, Google+ and Pinterest. If you are serious about building a business online, you need to build an email list with software like AWeber. I’m not a designer. I know enough code to make me dangerous, but I’m not a programmer by trade either. So how did I do this? The format of this site is not Genesis out of the box. I customized and customized and customized. I hacked and dug and researched. And I’ve even gotten to the point where I can create my own very basic plugins to satisfy certain needs. It’s easy to be intimidated by all of the things you can do with WordPress. Over time — through trial and error and the endless help available on the Internet — you’ll slowly begin to learn how to do some pretty amazing things. You’re probably thinking: So how did you get so much traffic in such a short period of time? You must be some sort of SEO expert or something. Nah, I’m not. In fact, in some ways I’m anti-SEO expert. I don’t obsess over keywords or run up big advertising bills. I don’t buy backlinks or bug sites to link to me. What I do is much more than keywords. It’s about creating lots of great content. But at the core, it’s about answering questions and solving problems. Here’s a little infographic I cooked up as a reminder. Do you agree with this approach? Share it, pin it, Tweet it… Pass it on!